Great Blue Jackpot slot machine from Playtech takes the original Great Blue slot which is much loved by fans of high variance slots, and adds a progressive jackpot. The mobile slot has a RTP of 95.02%, and just like the original has a wild symbol and also the Pearl Bonus feature which can go up to 33 free spins and a huge 15 multiplier, which along with the jackpot gives some massive win potential. So, if you love this classic game then read the full Great Blue Jackpot slot review below. When it comes to jackpot wins, bigger is always better – and we can’t think of a more appropriate Playtech game to receive a super-sized makeover than the consistently popular video slot, Great Blue. 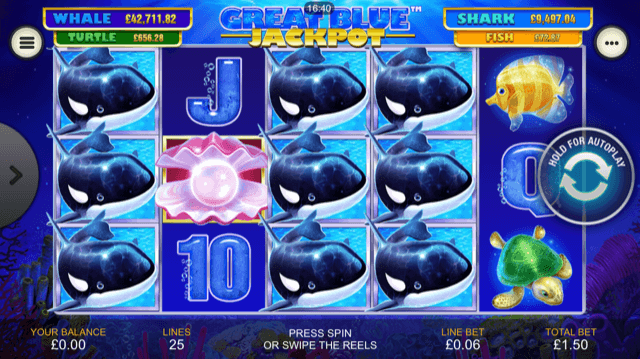 Featuring five reels and 25 paylines, the Great Blue Jackpot slot sees the titular mammoth marine animal appear as a stacked wild symbol on its reels, while the supporting cast includes sharks, turtles, tropical fish, sea horses and starfish. Further down the payscale, players will also see the conventional ace-through-nine playing card values, while a shimmering pearl features as the bonus-triggering scatter symbol. Playable from as little as £0.25 per spin across all desktop, mobile and tablet devices, the Great Blue Jackpot slot machine gives players the opportunity to trigger one of four progressive payouts. Named the whale, shark, turtle and fish, these prize pools can potentially award life-changing sums of money, which a pretty impressive feat is given the slot’s maximum bet value is a relatively inexpensive £12.50. Triggering the jackpot game is a simple matter of chance. On any random spin, players can be transported to a new screen displaying 20 coins, and they’ll then have to pick until they uncover three matching jackpot values. Entry to this feature alone guarantees that players will walk away with one of the progressive prizes, but if they’re incredibly lucky, they’ll bag the life-changing whale jackpot. In addition to this feature, the Great Blue Jackpot slot also retains the free spins game that made the original title such a hit. Triggered whenever players land three or more pearl scatter symbols, they’ll initially be awarded eight free spins and then will get to pick two out of five shells to uncover more games and multipliers. In total, players can earn themselves up to 33 bonus games or a prize multiplier worth up to 15x the stated paytable value – and to further sweeten the deal, the stacked whale symbols will also appear more frequently throughout the game and subsequent free spins can also be re-triggered indefinitely. A Whale Of A Jackpot? A classic slot with added progressive prize punch, what’s not to love about the Great Blue Jackpot slot? The game retains all of its original features and improves on them significantly, making it a sure-fire hit. Like our review of the Great Blue Jackpot slot machine? Check out these as well…..